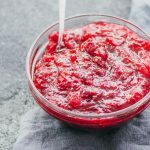 Try this easy homemade cranberry sauce with only a few ingredients. It’s a low carb and healthy alternative to storebought sauce. If using granulated erythritol, blend in a small blender for a few seconds until it reaches a powdered consistency. I use a Nutribullet. Add erythritol and water to a saucepot. Bring to a boil over medium-high heat, stirring occasionally. Add cranberries to the pot, stirring with the liquid. Bring back to a boil, and reduce to medium heat. Cook until the cranberries have split open and the sauce reaches your desired consistency, about 10 to 15 minutes, stirring occasionally. Add orange zest, stirring well for a minute. Serve immediately while warm. This recipe yields 4 g net carbs per serving. This doesn't include erythritol since it can't be digested by the body.